Marriage on the blockchain... it's forever and fun. The wedding bliss never ends with Crypto Couple! This comic is a blockchain card available on Book of Orbs in their CrystalsCraft collection. Book of Orbs is one of my top sites to issue rare digital art on because their system is so smartly designed. Plus, to date, I have sold over 100 editions of my various crypto-collectibles through this amazing marketplace. You can also visit this link to see all the markets where I sell rare digital art. Regarding this particular cartoon, funny marriage conversations are a popular recurring theme in my Silly Daddy Comics. In fact, you can also read many more of them in Silly Daddy Forever, which is my giant-sized comic book that came out last year. For the record, my wife is also my Steemit friend too. 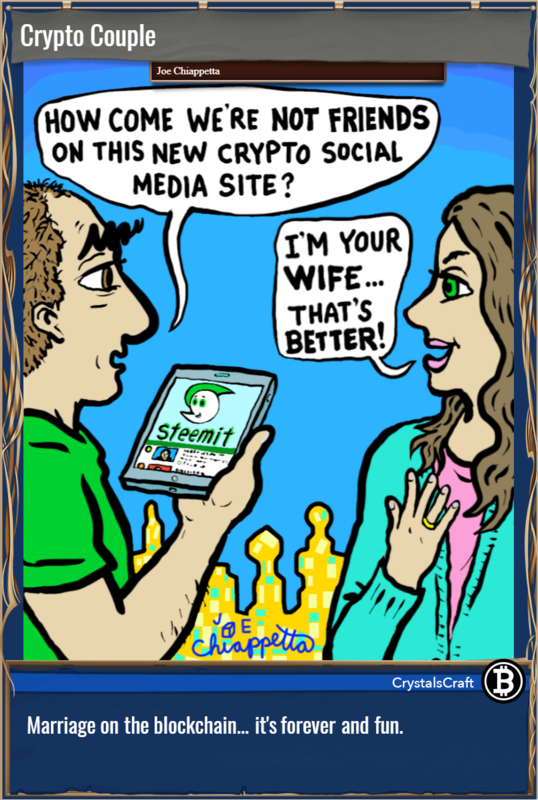 Note additionally that this crypto-art comic contains only 0.0123% of all the actual fun I have in my wonderful marriage to my awesome wife!